UP Samaj kalyan Paryavekshak Result 2019 | Check Latest News of UPSSSC Social Welfare Supervisor Cut Off Marks | UP Samaj kalyan Paryavekshak Supervisor Result 2019 | Answer Key. 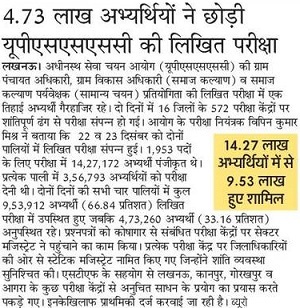 UP Veterinary University Recruitment 2019 Apply For Instructor Vacancies on Contract Basis | UP Veterinary University Instructor Recruitment 2019 | U.P. Pt. Deen Dayal Upadhyaya Veterinary Science University Latest News. UP Gramin Sadak Vikas Abhikaran Vacancy 2019 | Apply For Group C, Junior Assistant, Engineer Jobs in | UP Gramin Sadak Vikas Abhikaran Latest Vacancy 2019 | Pradhan Mantri Gram Sadak Yojana Bharti.